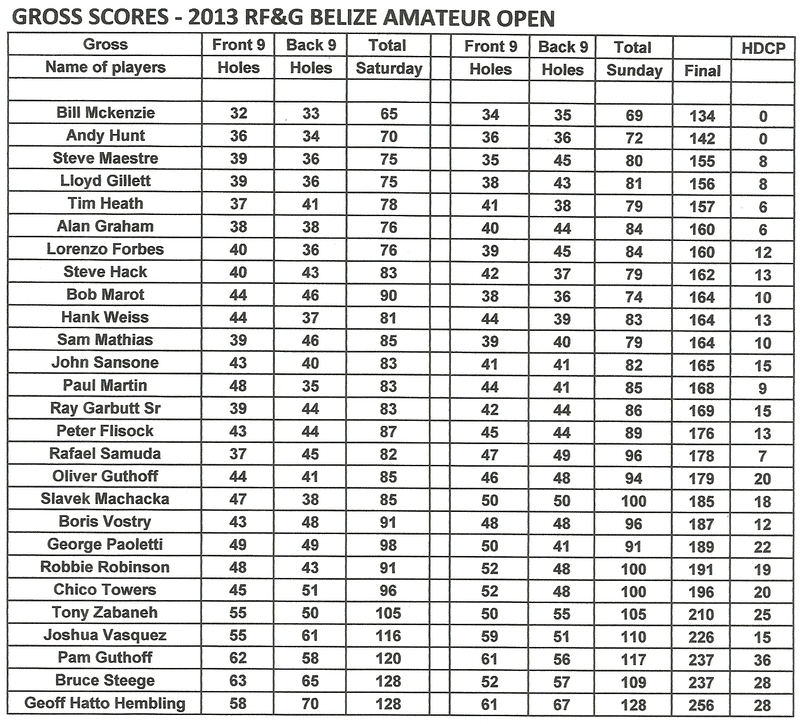 'Twas a terrific weekend at the Roaring River Golf Course for the RF&G Belize Amateur Open 2013. 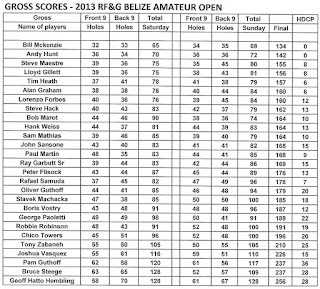 Players from all over Belize spent 2 days enjoying the weather and the challenge of dissecting the tricky layout at the golf course. We raised over $4,000 for local charities, which was a tremendous achievement again. The association has now raised over $11,000 in just a few years to assist local charity programs. Thank you to all our Sponsors who made this event possible. Especially to Guy Howison from RF&G who once again provided for a great event. 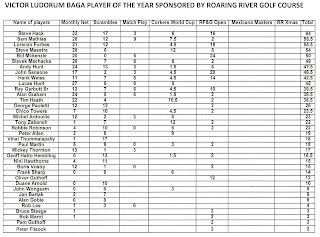 Thank you to Paul, Jenny and the staff of the Roaring River Golf Course. Finally, thks to those who organized and made this event possible. Also Ed, our photographer, without whom there would be no photos of the event. You can see these below. Welcome to 3 new members, Oliver Guthoff, Pam Guthoff and Peter Flisock. We hope you all had a great time and hope to see you at the next tournament on July 20th. Don't forget the Mexicana Masters is coming soon in August. Finally, the winner of the Grand Raffle Prize is Tim Heath, who wins a 2 Night stay at Belizean Shores and round trip airfare, courtesy of Maya Island Air. 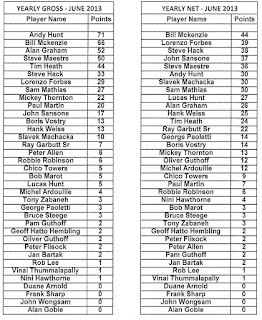 Below are the full Results of the Tournament. Click on the tables to enlarge them. 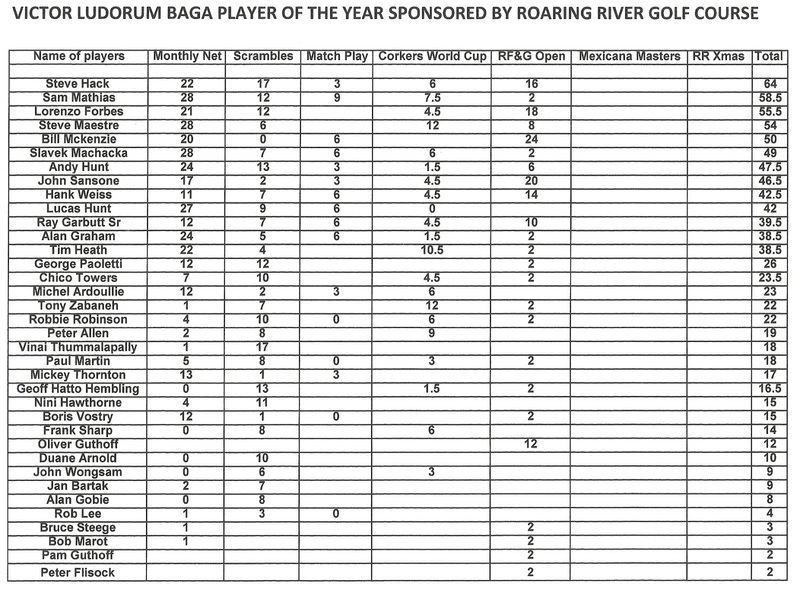 There have been some big moves and changes in the yearly tables and also the Victor Ludorum player of the year has changed dramatically as we move into the second half of the season.